An artist's illustration of Orion's first test flight. NASA is set to launch the first test flight of its deep-space Orion capsule this week, and you can watch activities leading up to the Thursday (Dec. 4) launch live online. The Orion capsule — built for NASA by Lockheed Martin — is designed to eventually take humans deeper into space than they've ever gone before. Thursday's unmanned test will help engineers learn more about how Orion's key systems operate in the harsh space environment. Starting Tuesday (Dec. 2), NASA will air various media and public events in the run-up to Orion's launch. You can watch the NASA TV Orion events live on Space.com. "During its 4.5-hour trip, Orion will orbit Earth twice and travel to an altitude of 3,600 miles into space," NASA officials said in a statement. 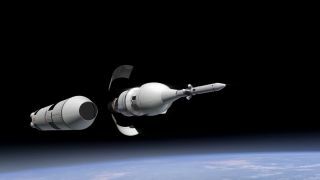 "The flight is designed to test many of the elements that pose the greatest risk to astronauts and will provide critical data needed to improve Orion’s design and reduce risks to future mission crews." Orion is expected to launch to space atop a United Launch Alliance Delta 4 Heavy rocket from Florida at 7:05 a.m. EST (1205 GMT) for the test flight (also called Exploration Flight Test-1). But on Tuesday, NASA officials will host a press conference about what this Orion flight and future tests could mean for Mars exploration. NASA officials will also host two pre-launch news conferences — one on Tuesday, the other on Wednesday (Dec. 3) — to discuss the test flight. Officials will also brief the media after the test ends later in the day on Thursday. For this test flight, Orion will make two orbits of Earth, with the second lap taking the capsule 15 times farther from the planet than the International Space Station. Officials have attached more than 1,000 sensors to the spacecraft to monitor its systems during flight. Orion will also beam down images from its cameras as it is flying through space. NASA will use the information gathered during the test flight to make improvements to the spacecraft before humans set foot onboard.